I usually like to get my new shelf display up about a week in advance of the event. 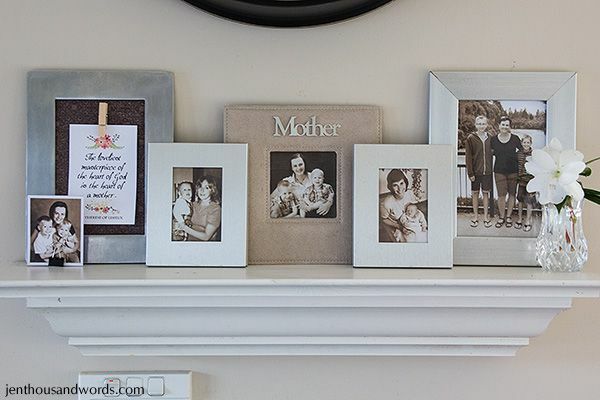 Alas, I have been too busy lately but I did finally get my Mother's Day shelf put together and will leave it up for a little while after Mother's Day. It features a quote which reads, "The loveliest masterpiece of the heart of God is the heart of a mother." - St Therese of Lisieux; all silver frames except one taupe suede frame onto which I stuck a silver Mother cutout; sepia photos in the frames and on standing in a little binder clip (left to right: me with our boys, Grant's mom with him as a baby, me with our boys, my mom with me as a baby, me with our boys recently); and a crystal vase that used to be my grandmother's, holding two white impatients.